Soda siphons are an excellent and cost-effective way to prepare your own soda water and soda drinks at home. Make any of your own sparkling refreshments or cocktails in seconds with a push of a button or a squeeze of a trigger. The soda siphon is designed with a built-in relief system for comfort and safety of use. Washable in warm soapy water and reusable time after time. This simple device allows you to infuse CO2 into any of your favourite drinks, simply store in the cannister and keep for up to two weeks in the fridge. Great for bars and barristers, does require a C02 soda charger. Product uses 8g Co2 soda chargers, you will need to buy soda chargers in addition to the soda siphon. Slimline design to make it easy to grip, the wide neck makes it easy to add liquids and ingredients as you go. The replaceable 8g soda chargers are easy and safe to use, perfect for beverages. When the cartridge has fully run out, simply remove and easily attach a new cartridge to keep making, carbonating and infusing your beverages. Carbonating your drinks can help you to enjoy the taste and the sensation of your favourite, wine, cocktails, fruit teas and juices, simply add you drink, screw on the lid and use your soda siphon. Give it a quick shake, let it rest and its yours to enjoy. Infuse new tastes into wines or spirits, try something new, mixing herbs and spices into your favourite wine, adding new tastes and aromas to enjoy. Sparkling refreshments and cocktails seconds with simple push-button operation. Carbonate your favourite beverages in seconds-sparkling cocktails, fruit drinks, ice cream sodas and the perfect splash to a great Scotch. Fresh seltzer every time, all the time. Pressure relief system built into head for comfort and safety. Our manufacturers for this product are Liss and Gastro, producing top quality Co2 products for the Global market. We can supply, Liss soda chargers, Mosa soda chargers or any iSi soda chargers. 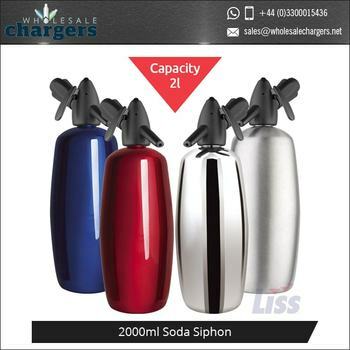 If you are looking for soda siphons for sale or for 8 gram soda chargers, the we are the supplier for you. You don’t have to worry about other businesses brands or designs with our products. 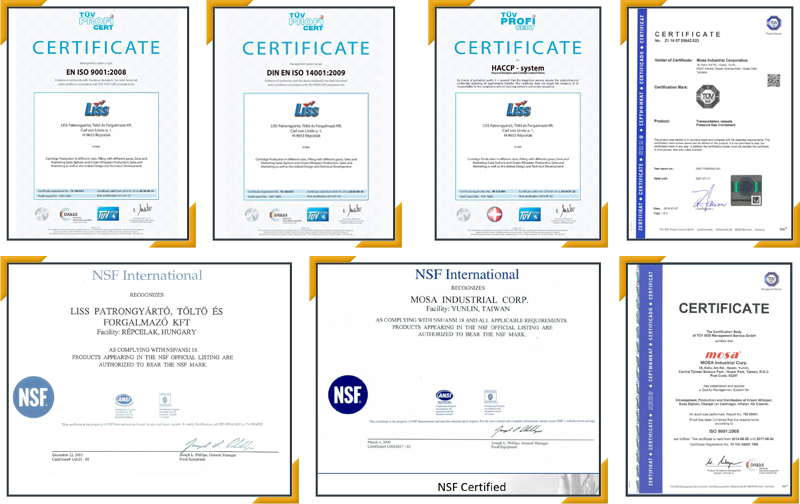 All our manufacturers provide us with fully customisable products, labelled only with the necessary information and half and safety guideline for each product. If you are trying to build your own sporting goods or beverage company this is great for you, allowing you to customise the products and packaging with your own designs and colour to best serve you and impress your customers. You can arrange for us to package and prepare the products to your specific design or do it yourself once we have delivered the products. Minimum Wholesale Order is 100 pieces. In any kitchen environment, it’s vital that safety remains a top priority, especially when it comes to preventing accidents. After all, the kitchen is full of potentially harmful tools, utensils, and appliances that, if not used correctly, could cause accidents. Nobody likes to think that the worst could happen, however safety should always be at the forefront of your mind when you’re choosing kitchen appliances from trusted and professional suppliers. After all, manufacturers that take short cuts with safety features and manufacturing processes, instantly put their customers at risk, and this can result in tragedy. For example, it was recently reported in the media that a lady tragically died after buying a cheap Chinese-made whipper online. Rebecca Burger, a lifestyle blogger, who was only 33 when she suffered a cardiac arrest after the whipped cream dispense has exploded and stuck to her chest has been injecting gas into the metal canister when it exploded. This once again highlights the importance of going to a reputable supplier for all of your kitchen appliances, including whipped cream dispensers. • The vast majority of poorly manufactured cream whippers tend to be made from aluminium and feature square or squarish plastic heads. All of the cream whippers that we provide have round heads. • The silicone seal inside the head is usually poor quality - discoloured and weak. • The cream release trigger uses a cross head screw that can unscrew – you cannot unscrew our products. • Before attempting to use any of our gas cartridges, ensure that you take the time to read through the manufacturer’s instructions that come complete with all of our products. • When using your cream whipper, no more than 1 charger should be released in a 1/4L or 1/2 litre whipper, and no more than 2 chargers for a 1 litre whipper. • The chargers contain Nitrous Oxide or Carbon Dioxide under great pressure. Any attempt to pierce the sealing cap of these chargers without the correct equipment could result in EXPLOSION INJURY & SERIOUS FREEZE BURNS. • EXPLOSION DANGER - do not incinerate or expose chargers to the sun or heat. Temperature not to exceed 50C. • Pressurised gas cartridges must not be taken on board an aeroplane. No excuses, you may be prosecuted. • Cartridge contains Nitrous Oxide (E942) under high pressure. • Please only use with a device approved for this cartridge and follow manufacturer’s instructions. • Non-aerosol. Non-refillable. Recyclable steel. • Never dispose of full cartridges. • Explosion danger: 50C max temperature. • Do not take on board an aircraft. • Colour: Silver or Grey. • For food use only. • If you are burnt by freezing N2O you must immediately seek medical advice. A N2O burn can cause deep tissue damage, which is not immediately obvious at the time of the injury. All N2O products, including our whipped cream dispensers & n2o nitrous oxide chargers, can be used to accommodate the specific application demands that come hand in hand the food and beverage industry. From classic cream application and aromatising and infusion through to espuma and filing and decorating, there are lots of ways that our dispensers and Nitrous Oxide chargers can be used to optimise productivity, precision and results in both residential and commercial kitchens. Whippers are used in all areas of the catering industry when it comes to whipping cream and preparing sauces, cocktails, foams, espumas, as well as many other culinary delicacies. And despite many advances in technology, whippers remain one of the best ways of preparing cream, and other liquid-based ingredients. Infusing techniques are adopted my chefs in all corners of the world when it comes infusing liquids with different aromas. 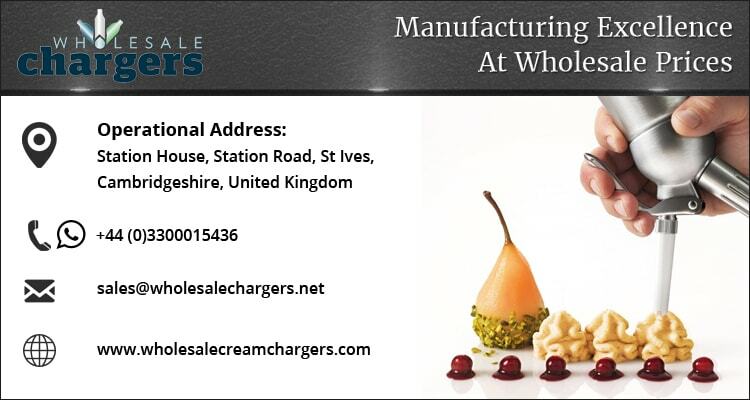 The process works when the N20 gas flows out of the cream charger into the liquid, which then forces the liquid to bind together with the N20 due to the high pressure that it is under. This then flavours the overall substance. Once the pressure in the whipping device has been released, the N20 then forms bubbles and takes on the flavours of the ingredient, transferring the aroma into the liquid. The Spanish word for foam, Espuma involves creating airily light foams to go on top of a range of different beverages. To achieve this texture, people in all corners of the globe used whippers and as a result, they are now a common sight in many modern-day kitchens. It’s easy to prepare espumas from purees, cream and extracts, from juices, coulis, as well as soups or sauces, and they can be added to a diverse range of dishes and drinks. Espunas are not only a great way to enhance the flavours of food, but they are also a great way of optimising the aesthetic appeal of food. When it comes to adding a new and exciting dimension to your favourite dishes, it’s all about getting your filling and decorating right, especially when it comes to enhancing its presentation. There are a whole host of high performance tools that can be used to unleash your imagination in the kitchen, allowing you to experiment with different flavours, textures and finishes. A vast range of our Co2 products is used within the beverage industry and can be used to create drinks and perform rapid infusion. We offer a range of different cartridges that can be used for pressurising and injecting Co2 into standard 2-inch neck plastic homebrew beer barrels. Filled with 8 grams of natural carbon dioxide, all of our cartridges can be used for successfully carbonating and pressuring lots of different drink types. Please note: you should always check that your barrel has the right adapter, as it’s vital that you keep your barrel pressurised. This is because as it empties, it will ensure that air is kept out in order to preserve your beer. Our Co2 soda charger bulbs can also be used with a wide range of soda makers, allowing you to enjoy refreshing, sparkling soda water whenever you please. Ideal for adding a healthy dose of fizz to your favourite drinks, a soda maker will also allow you to add an extra fizzy kick to long drinks and cocktails. Carbon dioxide is a pure and natural product that has been created deep within the earth by volcanic processes, therefore it is now used as an organic ingredient that naturally keeps your drinks fresher for longer. We also provide a great choice of cylinders that contain 16 grams of natural carbon dioxide. Suitable for all brands of beer taps, these cylinders are suitable for lots of beer and beverage services. The coffee industry is constantly evolving, as more consumers than ever before are demanding new types of coffee! As a result, bar and café innovations are constantly cropping up on our radar, and this revelation is currently sweeping all corners of the world, especially when it comes to experimenting with the endless possibilities that come hand in hand with Nitro coffee. The good news is, you now don’t need to invest in expensive equipment to produce Nitro cold brew coffee and beer, as you can now purchase N2 chargers and whipped cream dispensers with coffee or cream in them that can be used to make the perfect brew or cold drink. Our 2-gram Nitrogen chargers can also be used to prepare Nitro Coffee and Nitro Beer quickly and easily. Having originated in Stumptown, Portland, Nitro coffee and beer have continued to increase in popularity and demand for this drink is currently at an all-time high. Perfect for making drinks sweeter, creamier and richer, this technique is used throughout the beverage industry, in both small independent cafes and multi-national coffee chains, bars and restaurants. Fill with your favourite stout or ale. Charge with one Nitro Charger. Shake vigorously to dissolve the Nitrogen in the beer. Restricting the amount of oxygen in the coffee, Nitrogen works by slowing down the rate of oxidation in the coffee. It is this process which makes coffee taste sour and bitter. With this in mind, because Nitro coffee retains its fresh flavour for longer, it can be prepared in advance. How do you make Nitro coffee? Fill with your favourite cold brew coffee. Charge with one of our Nitro Chargers. Shake vigorously to dissolve the Nitrogen in the coffee. Our high-performance nitrogen cartridges can also be used in place of 8g Co2 cartridges in order to pressurise and preserve homebrew beer kegs or wine. Did you know that our Nitro infusions are also ideal for making infused cocktails? And for optimum results, you should use with our Soda Splash carbonators in order to make a variety of different infusions!